Jeroen van Erp graduated from the Faculty of Industrial Design Engineering at the Technical University of Delft (NL). In 1992 he co-founded Fabrique, a multidisciplinary design agency, where he soon established the interactive media department, a brand new area of design at that time. Fabrique currently employs over 100 artists, engineers and storytellers and has worked for supermarket chain Albert Heijn, the Rijksmuseum, the Louvre Abu Dhabi (UAE), the University of Gent (BEL) and the city of Agra (IN). Van Erp is currently partner and innovation strategist at Fabrique. 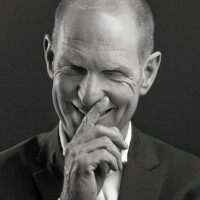 He is also chair of the Dutch Creative Council and board member of the Association of Dutch Designers, the Design & Emotion Society and the What Design Can Do event. In November 2015 he was appointed professor of Concept Design at the Technical University of Delft.